Spend your mornings mesmerized by the Mediterranean. Enjoy your evenings enchanted by life by the stunning Spanish coast. Where soaring nine-feet-high floor-to-ceiling windows open up to spectacular views of the Barcelona cityscape and beaches from virtually any guest room, sensational sights entice inside, with innovative interiors by Bofill Design. Here in our upscale landmark of contemporary sophistication, devote yourself to a dream life of worldly pleasures, where waking up is wonderful in the signature W bed with pillow-top mattress, fluffy goose-down duvet and 350-thread-count Egyptian cotton sheets. 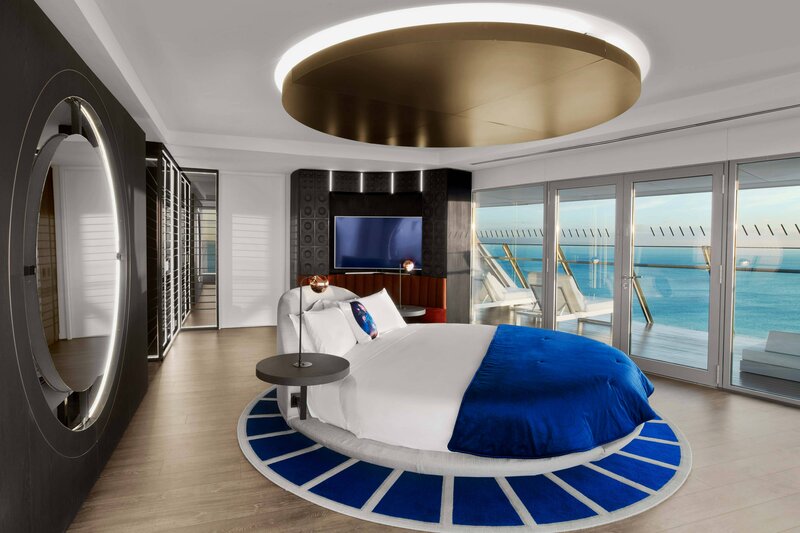 Lose yourself in a whirlwind swirl of high-energy interiors, vivid design, cutting-edge technology and uniquely modern amenities to fulfill every wish. Spa sink-side six bath amenities. High-Speed Internet Access. W pillow menu. Spectacular in-room entertainment. So revel in magnificence when you roam away from home. Stay a while. 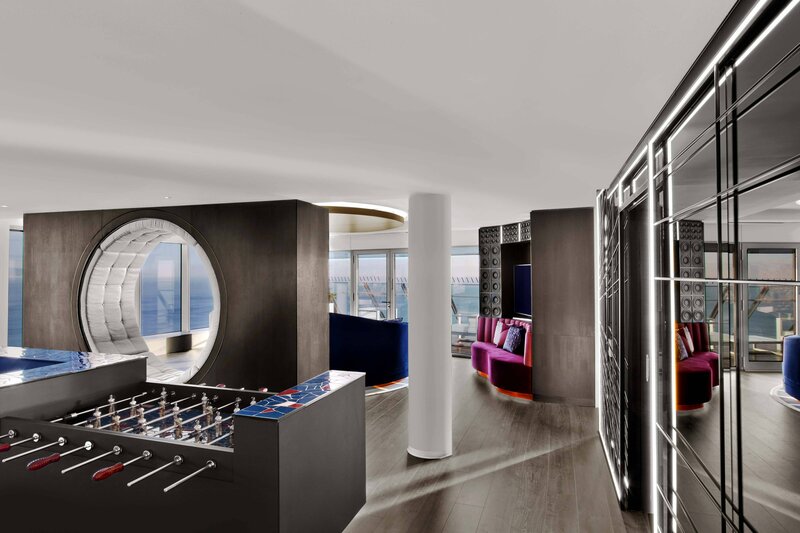 Turn up the rhythm in an entertainment and relaxation space, featuring a Gaudí-inspired bar, foosball table and 65-inch curved-screen TVs. 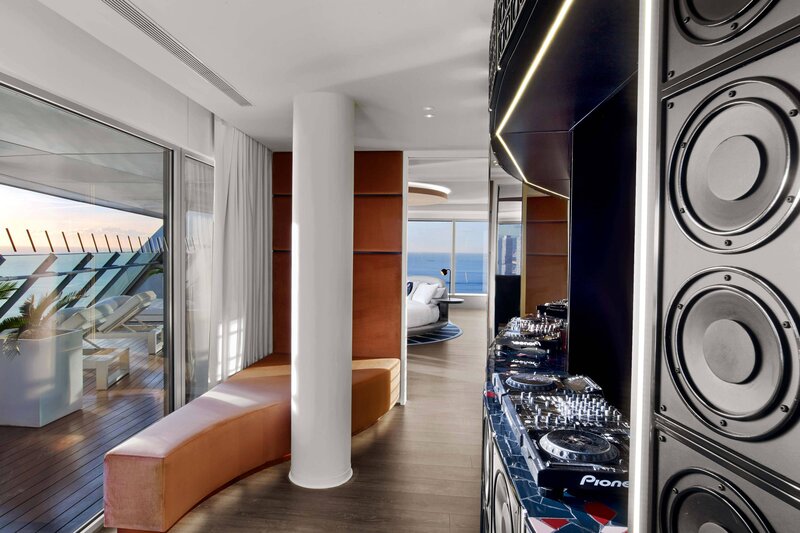 Set the mood with a pulsating full-wall speaker system and DJ booth. Plunge into a Jacuzzi on the huge terrace, relax and recharge on the private sunbeds, and set the bespoke lighting to match your mood. Whether it’s an amenity gift to a guest or for yourself, now or later, we’ve got you covered. Send a sweet amenity treat, whatever the occasion…just ask.